Customers of Singapore Airlines travelling from Seoul can look forward to a more luxurious experience on the ground following the official opening of the airline’s SilverKris Lounge at Incheon International Airport. The lounge features wireless internet access, a business centre with desktop computers, shower and restrooms, televisions, as well as a selection of warm food and light snacks. “The SilverKris Lounge is a key element in Singapore Airlines’ premium service offering, which begins on the ground and continues in the air. The new lounge, together with our four daily Seoul flights, demonstrates our commitment to the important South Korean market,” said Singapore Airlines general manager Korea, Sia Nam Kung. 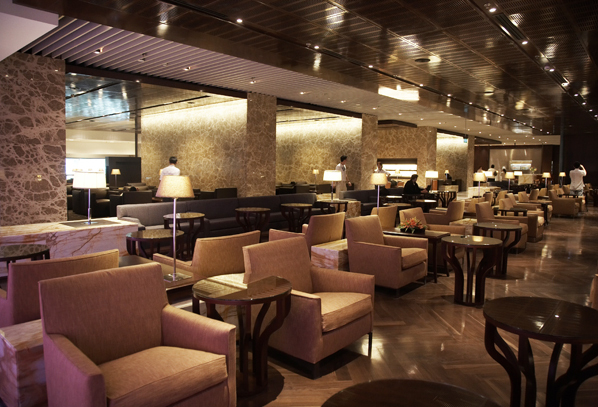 In August 2012, Singapore Airlines announced an investment of S$20 million in SilverKris Lounges over five years to enhance the travel experience of its customers. At the same time, SIA appointed renowned architectural and interior design firm ONG&ONG to develop a new design concept to be applied to all its airport lounges worldwide. The new design concept will be rolled out progressively to SilverKris Lounges from later this year, beginning with the lounge at Sydney Airport. Including a recently opened lounge at Delhi Airport in India, Singapore Airlines now has 15 SilverKris Lounges at airports around the world. Singapore Airlines will be investing nearly SGD$95 million to refit ten Boeing 777-200ER aircraft with new long-haul cabin products to provide customers with additional space and comfort. The cabin upgrade programme will provide greater product consistency across the airline’s long-haul fleet, with Business Class seats that convert into full-flat beds and larger in-flight entertainment screen sizes for both Business Class and Economy Class. The first refitted B777-200ER will operate between Singapore and Amsterdam earlier this year. Upgraded B777-200ERs will be deployed to more destinations in Europe and to points in India, South Africa, Australia and New Zealand as additional aircraft are refitted. In Business Class, the richly upholstered leather seat reclines up to 125 degrees and unfolds into a 76-inch full-flat bed. Also featured on the Airline’s Airbus A340-500, A380 and B777-300ER fleets, the forward-facing, four-abreast 1-2-1 configuration offers all customers direct access to the aisle. The award-winning KrisWorld in-flight entertainment system also features a 15.4-inch LCD monitor and an extensive selection of audio and video programmes. In Economy Class, personal LCD monitors will be upgraded to 9 inches from 6.5 inches. Seat covers, designed by Givenchy, will also feature soothing colours as well as richer and softer fabrics, similar to those found on Singapore Airlines’ A380s and B777-300ERs. Singapore Airlines customers are also now able to enjoy seamless travel to more cities in the United States through a codeshare agreement with Virgin America. “We are pleased to announce this partnership with Virgin America which extends our network even further within the United States. “The United States is an important market for Singapore Airlines and through this partnership we can offer our customers more travel options to more destinations,” said Singapore Airlines acting senior vice president sales and marketing, Chin Yau Seng. Under the agreement, SIA will add its ‘SQ’ code to Virgin America-operated flights serving Chicago, Fort Lauderdale, Las Vegas, Palm Springs, Philadelphia, Portland, San Diego, Seattle and Washington D.C., from SIA’s West Coast gateway points of Los Angeles and San Francisco. “This agreement enables us to offer guests a seamless, award-winning travel experience across continents and significantly expand connection options in North America for Singapore’s savvy travellers,” said Virgin America senior vice president for planning and sales, John MacLeod. Singapore Airlines currently operates 45 flights per week to five points in the United States, namely Houston, Los Angeles, Newark, New York and San Francisco. Singapore Airlines will be increasing frequency to points in Australia, Asia and Europe during the Northern Summer operating season (March 31st– October 26th) to cater to growing demand in select markets. A fourth daily service will be operated to Melbourne, up from the current three flights per day, while Adelaide flight frequency will increase to 12 per week from ten. The increases will lift to 121 the total number of flights operated to Australia each week by Singapore Airlines and subsidiary SilkAir. Within Asia, services will increase to both Fukuoka and Osaka in Japan. Fukuoka flight frequency will increase to daily from five per week, while Osaka flight frequency will increase to twice-daily from 11 per week. Between May 20th and August 11th, Singapore-Moscow-Houston frequency will increase to daily, up from the current five flights per week. As recently announced, services to Copenhagen will increase to five flights per week from three with effect from March 31st. As also announced recently, non-stop services between Singapore and Los Angeles and between Singapore and Newark will cease, with the last departures on October 20th and November 23rd, respectively. Services to Los Angeles via Tokyo Narita and to New York JFK via Frankfurt are unaffected. Singapore Airlines has come a long way since its founding in 1972, evolving from a regional airline to one of the most respected travel brands around the world. There is more information on the official website.